We knew the septic work was set to begin soon, but it started – and was just about completed! – on Friday. We were told that we could flush at this point! Alas, if only we had a toilet or sink installed. Soon enough. We arrived Friday morning to find work had already begun on the septic. And the 40,000 lb loader flipped the big rock out of the way. Tanks arrived in the afternoon. Very cool logistics on all of this. At the end of the day, this lovely instrument stayed put – more work to finish on Monday. The old window, restored and installed. Someday we’ll pick trim colors and paint it up. Primer for now. Foam backer rod installed. That part went quickly. Another look at backer rod. Dinner break! 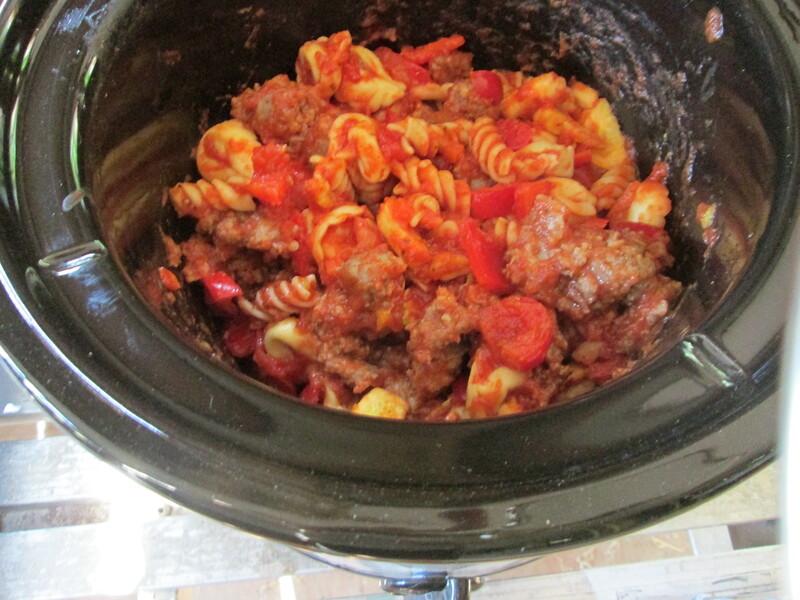 We had to do an evening session today, so we brought a crock pot of pasta & veggies. 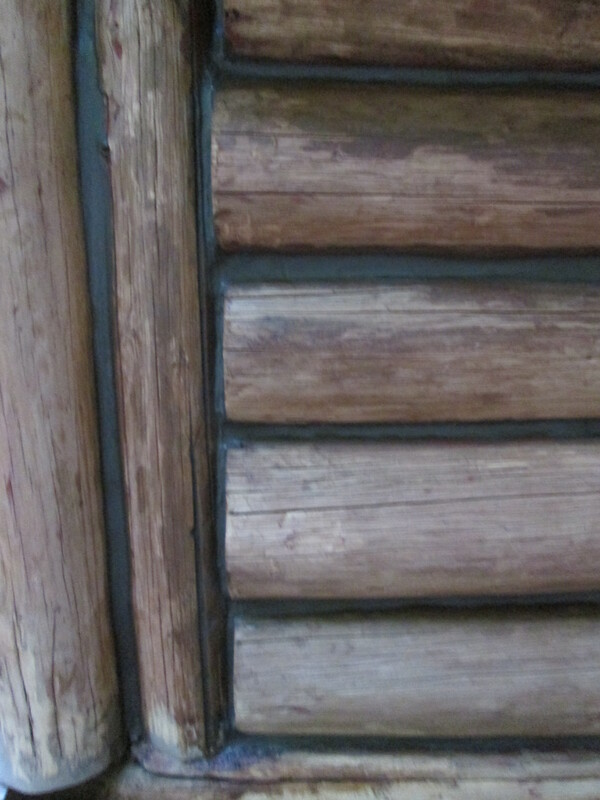 After caulking: it came out OK, despite some initial frustration. We are finally installing new things, not just tearing out old. What a great feeling! 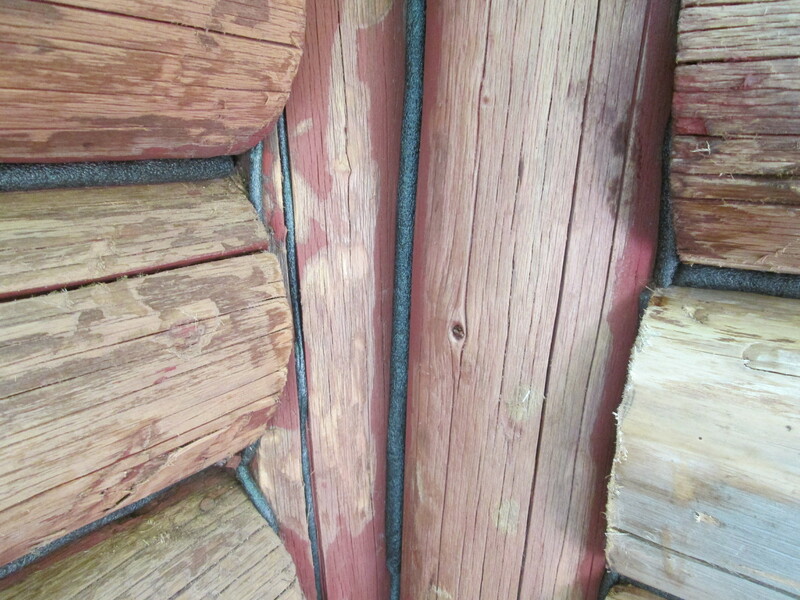 First, we visited our local cedar mill and got a pile of trim boards for the exterior. Clean, fresh wood milled to spec for totally reasonable prices. Bonus: the dog was just hopping up and down with joy (surprise?) at seeing lots of cows in the fields on the drive out. He’s always good for a laugh. Around the side – cleaning things up. A small triangle covers a multitude of sins. 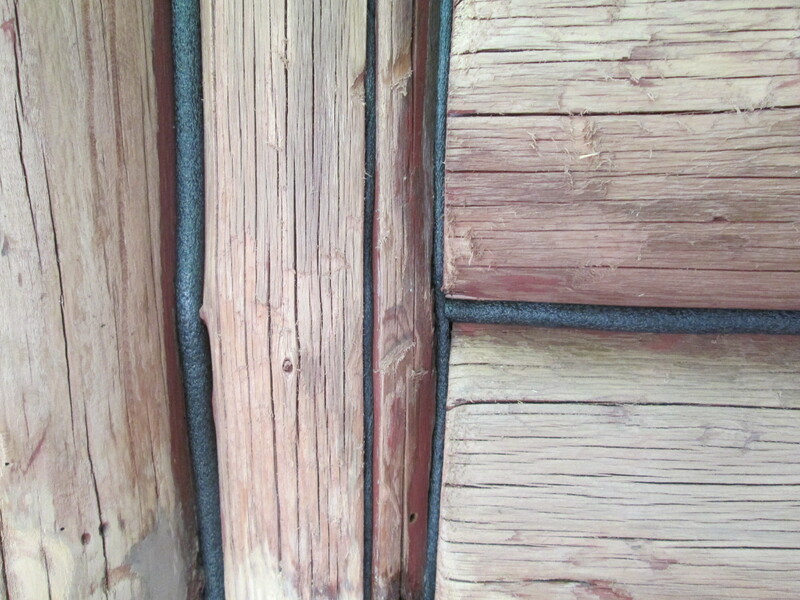 It will look better when caulked in. Fresh new bands across the front and back. So crisp! Second, we finally got the pesky doors installed. You know, the door that was not a door but rather a sidelight, that took a year of evening work in the basement to get ready to go and two hours on the phone with tech support to figure out? It’s in. And it’s just gorgeous. I pretty much cried when it swung shut perfectly. Start. After a year of re-working, we were ready to begin. Sticky stuff lines the sill pan area. And it’s in! It keeps looking like the door is open – there is so much light! From outside. What a difference! Handlesets from an auction – the nicest we’ve ever had. The other door is one we happened on when wandering our favorite (local) building supply store. It looked so lonely in the corner, so we asked about it. And the discount was just too good to pass up. The salesman reminded us we’d have to hang it because there was no jamb – yeah, par for the course with us. And no problem, once we found a stash of un-used jamb stock and a mahogany sill at a local ReStore at a price that worked for us. We spent the day sorting out which cuts to make where, and getting it hung. No handleset yet – we have it, and it’s ready to go, but we were done for the day. For now, it’s ‘locked’ old-school, with a nailed-up 2×4. No big deal; if someone wants to break in, there’s a blue tarp for a window. Before – the old door was tired. Cute, but tired. Want to buy an old door? Coming soon to Craigslist. Widened! New door is a full 36-incher. The pile of jamb stuff we started with. Go! Got it together by lunchtime. So much wider, lighter, and cleaner! And another shout-out for Porter Cable’s hinge template (and their strikeplate template too). If you’ve been thinking about it, buy it. Worth it 110%. Whew! We are tired. 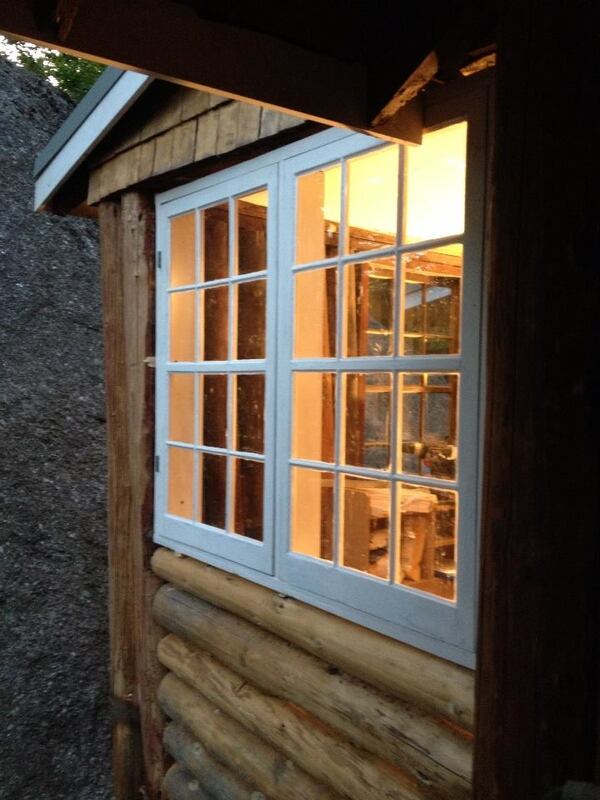 We have been out there every day and are almost, ALMOST ready to start caulking and staining the logs. The goal of this whole summer run-up. We are so pooped that we set up this post the other day and then never finished writing it! So, expect another post shortly because – drum roll – we just finished installing both new doors. The back corner is situated at the bottom of a granite sluice. No surprise it was so rotted. Here we go, cutting up our house again. Logs were in great shape, sill not so much. 1942 penny found on top of the sill. Instead of chucking a loose block in a hole in the wall, we actually mortared ours in! New sill atop new masonry: nice! And the wraparound to the back. With knees. New cripple wall to replace the problem area. Clad with cement board for now. Later, stone veneer. Solid. We also reinforced the sill in the corner across the way. Done with rot!